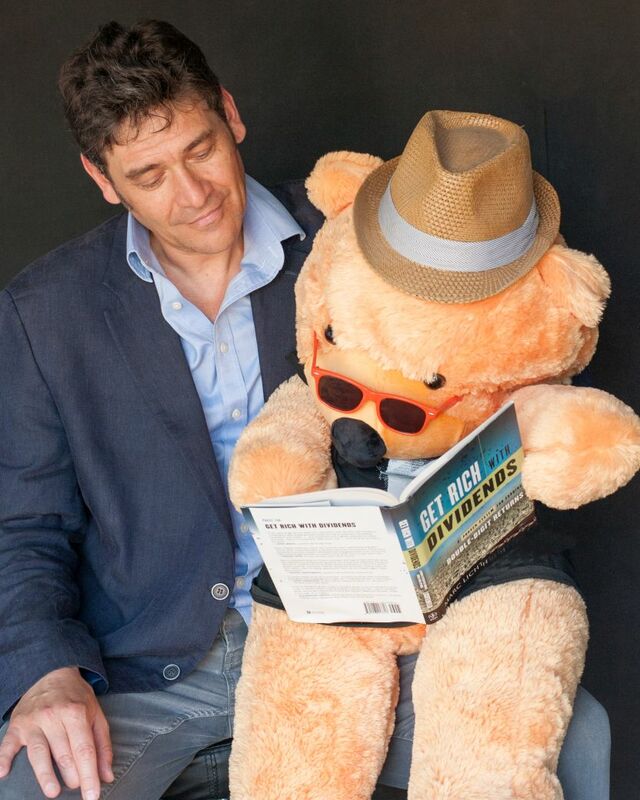 -Outlook 2019: The 'Bear' That Keeps On Rolling? One of the old beliefs on Wall Street is that pivotal points of reversal in market trends are usually preceded by front covers of popular magazines. The most famous example of this adage remains the "death of equities" declaration by Business Week in August 1978, roughly three years before one of the strongest bull markets announced itself. 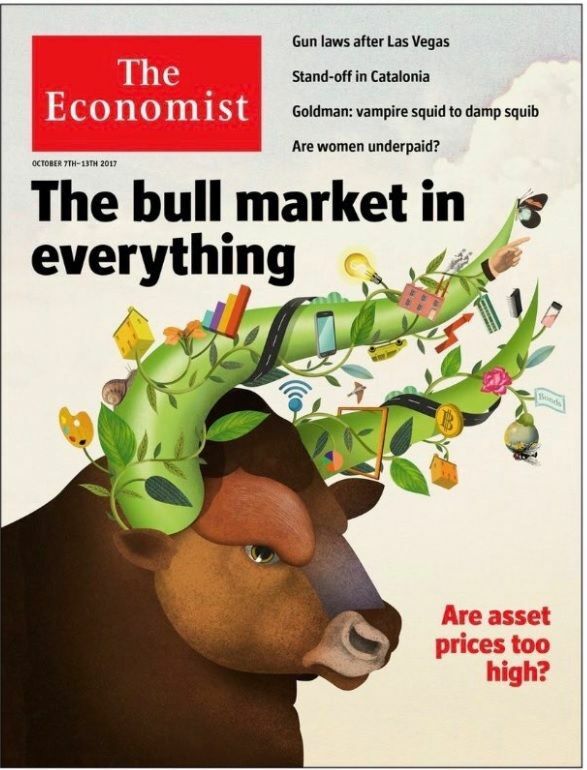 This time around, Wall Street eyes are looking back at the cover of The Economist which in early November last year declared A Bull Market In Everything! To be fair to the team at The Economist, that declaration went in hand with asking the question: when will it all end? Over the past four years equity markets have experienced three serious pullbacks. First there was the gradual deflation that started in late May 2015. It was preceded by nearly six months of piling into everything -anything- that paid out dividends and represented "yield". The downturn that subsequently unfolded simply kept on going until a capitulation bottom was reached in February the following year. Next came the Big Portfolio Switch late in the third quarter of 2016. Most Australian investors won't have too much recollection about this particular drawdown because banks and resources became the new momentum trade and most portfolios would have been overweight these two sectors. Next we had a bit of a wobble in February-March this year, but as things turned out, that really was just a blip ahead of what would descend upon us in October-November. With only five weeks left until 2019 arrives, the Australian share market is in negative territory year-to-date, and (potentially) about to accumulate double digit percentage losses over three consecutive down-months. Given we are living through a period in which most investors, consciously or otherwise, are trend followers, one might be inclined to think factors two and three are tightly intertwined, which is often the case. But back in 2015 there was no sudden switch in portfolio allocations which meant the pullback was gradual, drawn out and relentless nevertheless, but many an investor had been positioning anti-consensus and was simply feeling a lot of pain on the way down. By late 2016, however, just about everybody had become overweight cycle-agnostic stocks and expensive defensives. Equally important, there was a genuine general belief that newly elected President Trump was about to ignite the late cycle reflation trade. And thus the switch was violent and relatively quick, but equally relentless. By now we are late in 2018. September (-1.78%) was mildly challenging, while October (-6.1%) took no prisoners and November (-2.14%, thus far) failed to deliver the widely anticipated relief rally. Three negative months in a row. Most assets down year to date, including most equities in Australia. Time to sit up and take note, if one hasn't already. Observation number one, and this one cannot be highlighted soon enough: holding cash has really made a key difference throughout the extreme day-to-day volatility over the past nine weeks. This was not as much the case back in 2015 and 2016. Gold has, sort of, stood its ground throughout the turmoil, but that's the best it could do and it equally showed some wobbles at various times. The same can be said about government bonds, but inside the share market there have been very few places to hide and not feel the pain of broad selling pressure. Traditional safe havens such as Woolworths ((WOW)), Transurban ((TCL)) and Sydney Airport ((SYD)) initially were sold down as well, if they hadn't fallen quite noticeably throughout September already, but they regained their status in November as amidst the global share market turmoil bond yields started dropping. (When institutional investors shift funds into bonds prices rise, which lowers the yield, with positive read-through for bond proxies in the share market). Only few stocks have managed to keep the sellers at bay from the get-go, posting gains along the way, when others kept falling. Stocks like Goodman Group ((GMG)) and Charter Hall ((CHC)) certainly picked their opportunity to shine when all got pulled into darkness, but equally so stocks including Alliance Aviation Services ((AQZ)) and TechnologyOne ((TNE)). Not all of these performances would have been predicted beforehand. In fact, on my daily observations most movements in share prices have been irrational, illogical and inexplicable, other than that selling begets more selling and investors simply were looking to pull cash out of the falling market. Hence there have been quite a number of utter surprises, both positive and negative. Which just goes to show, when panic buttons are being pressed and withdrawing liquidity becomes the dominant force du jour, one simply cannot be too confident about what likely comes next and what won't happen. Part of the reason as to why this withdrawal has been so chaotic, and so broad-based, even when only a selection of stocks had been carrying the index to a new cycle high in Australia, is because of the multitude in factors that impacted, all pretty much around the same time. This is not simply about the Federal Reserve tightening rates and US bond yields rising. This is equally about global economies losing momentum while there seems no relief in tensions between Trump and Beijing. This is also about market consensus probably being too optimistic on corporate profit margins, and about growth stocks becoming a well-overcrowded trade, while the valuation gap between high growth and low growth stocks -"Growth" versus "Value"- had once again stretched to extreme. In Australia, worries about Emerging Markets falling and overcooked US share market sentiment mixed with a deflating housing market, and ever more bearish forecasts, and growing signals the consumer is starting to hoard instead of continuing to spend. More revelations about the banks at the Royal Commission and a seemingly dead men walking federal government in Canberra, while many an investor worries about Labor's intention to fix the budget through reining in negative gearing and franking credit cash repayments, further add to the quagmire. This is equally about the sum total of extreme liquidity injections by the world's major central banks coming to an end, with every investor worth his salt knowing full well this never before seen injection has pushed up asset prices around the world over the years past. But now global liquidity is pulling back, what will be the exact effect on global assets? Then there is that growing sense this could be the final phase of this cycle. Combine all of it together and it is not difficult to see why investors are uncertain and worried, and why many an expert preaches caution and restraint. Actually, if one is brutally honest about it all, the first question to ask is why did it take this long for the US share market to finally take notice? We can ask the question, but the answer doesn't really matter. Markets finally woke up to the serious challenges that lay ahead, and they responded with a vengeance. Now the world and its outlook have materially changed. For investors it's best to take notice, and respond responsibly. The FNArena/Vested Equities All-Weather Model Portfolio had been outperforming the broader index, while at the same time throughout the second and third quarter the percentage of cash held in the portfolio increased steadily. At first it seemed this caution had been applied too early, but by the time October arrived it became instantly clear the level of cash was nowhere near high enough. So we increased it. I advised FNArena subscribers they should do the same. The logical way to achieve this is by getting rid of failures and disappointments. Most investors "take profits", which means they sell off winners and keep the losers. I, however, am convinced the best way forward is by owning higher quality, solid, reliable and sustainably growing companies. In my experience, these are most likely among the outperformers in the local share market. The Portfolio only had a few genuine disappointers, so a general review and re-allocation had to take place. It is here where past experience mixes with share market "science" and personal assessments. Overlooking the portfolio as a whole, the highest priority is not whether one is attached to a certain stock or not, and certainly not what price had been paid for it. The highest priority is freeing up cash. The aim is to reduce risk. So you sell/reduce exposure to leveraged balance sheets with lots of debt (if you happen to own such stocks), in particular small cap stocks and cyclicals. Large cap stocks might fall less than smaller cap stocks. In the latter case: watch out for the drying up of liquidity or the departure of one large shareholder. Companies that do not make profits (as yet) are most vulnerable, in particular if they are small. Don't stick with companies going through a bad news cycle (the last thing you want is them issuing yet more bad news). The most important thing is to go through the portfolio on a case by case basis, every time trying to assess what type of risk are we taking on in this particular case. Part of my consideration was to trust in the quality of out-of-season financial results reporters in that they were most likely to announce good news. Indeed, good news is what most have reported, but in many cases this did not stop the selling, or sometimes only briefly. One notable exception has been Appen ((APX)) which is acting like a stock reborn after management upgraded guidance for the year in mid-November. Another portfolio member that has put in a remarkable performance, helped by yet again a high quality growth performance, is the aforementioned TechnologyOne. Note that out of caution, the portfolio exposure to both had been reduced, as part of the overall de-risking. Decisions do not have to be 100% in or out. It is easier to buy more shares at a lower level than it is to add from scratch again (it's how the human brain is wired). A number of other stocks saw their initial rallies upon good news being used as an easy source for more profit taking, including REA Group ((REA)) and ResMed ((RMD)). Others held up well initially, but then succumbed to that same principle of becoming logical targets for profit taking. Here I would certainly include Bapcor ((BAP)), DuluxGroup ((DLX)), Xero ((XRO)), and Orora ((ORA)). Certainly, a large contingent of stocks has fallen significantly more than I thought they would, and way more than seems justified even if profit forecasts for the year ahead must come down. In cases like Macquarie Group ((MQG)) and Link Administration ((LNK)) the world out there is simply showing its ignorance and lack of specific knowledge because both companies are not nearly as much aligned with the general status in the share market, but during times of panic and turmoil there is no opportunity to set up a debate with the sellers. And other investors tend to think if the share price drops it must be for good reason, of course. One of the most difficult decisions to make during the past two months is to sit quiet and not re-allocate cash back into the share market. We are far from convinced that the end of turmoil is near. This can potentially get a lot nastier, still. Most importantly, there will be rallies here and there (there always are), but it seems highly unlikely this new phase for global risk assets will be over soon. The down trend between May 2015 and February 2016 ultimately lasted nine months with a sharp sell-off in the final two months. The portfolio switch post Trump election lasted five months before selling down stocks like CSL ((CSL)), Aristocrat Leisure ((ALL)) and NextDC ((NXT)) reversed into new uptrends. Having said so, we did buy in a few extra shares near what might have been the market bottom (for now) recently, and among the opportunities we jumped upon were Macquarie, Link Administration, Bapcor, Carsales and Orora. Prior to last week, circa 30% of the All-Weather Portfolio had no exposure to the share market. On my assessment, this has been one decisive factor in keeping overall losses contained, and smaller than the broader market. That percentage has now declined to circa 25%, which means 75% is invested in the local share market in a basket of 20+ stocks that have no resemblance to any of the market indices. While we have taken the view the changing outlook should not be underestimated, we are also of the view this does not by default mean we are staring at a repeat experience of 2008-2009 or 2000-2002. It doesn't even have to be a repeat of 2011-2012 or of 2015-2016. But neither of such scenarios should categorically be excluded at this stage and we remain prepared to further reduce risk if circumstances so require. In the meantime, we agree with other voices elsewhere two months of (near) persistent weakness for the local share market has made a large number of stocks look very attractive. Instead of looking through a list of stocks that have fallen the most, as is the inclination for many, I'd strongly suggest investors continue de-risking their portfolio. In terms of fresh opportunities to take advantage of, why would any investor with a longer term horizon now ignore the fact that high quality, less risky, solid and reliable performers in large numbers have sold off -15%, and more? This is where the real opportunity lies in today's share market. Paying subscribers have access to my research into All-Weather Performers, including a dedicated section on the FNArena website. I strongly suggest this becomes your new Ground Zero for the future. In terms of All-Weather Portfolio performance, October saw a loss of -4.71% compared with the -6.05% that befell the ASX200 Accumulation index. Thus far in November, with three more trading sessions left, the loss is -1.86% for a combined -6.57% for the past eight weeks. The ASX200 Accumulation index has thus far added -2.14% for a combined -8.19%. Calendar year to date the index is down -2.65% and for the running financial year it is down -6.65%. The All-Weather Portfolio has remained in positive performance territory throughout calendar 2018, albeit with a non-spectacular +1.17% year-to-date (still marking a noticeably better performance); for the financial year to date the performance number is -5.32%. Late addition: As we are about to publish on the final trading day of November, it appears the All-Weather Portfolio might just escape a negative performance for the month, unlike the broader index. He may not be perfect in all his views and calls, but Dennis Gartman still carries more day-to-day hands on financial markets experience than most of us have aged since birth. Below are his Rules of Trading, as updated and released at the end of last week. Adding to losing positions will eventually lead to ruin. All great market humiliations are precipitated by someone doing so such as the Nobel Laureates of Long-Term Capital Management, Nick Leeson, Jon Corzine and now optionsellers.com. As traders/investors we are to fight on the winning side of any trade. We are pragmatists first, foremost and always with no long-term “allegiance” to either side. Capital comes in two types: mental and real. Holding losing positions diminishes one’s finite and measurable real capital AND one’s infinite and immeasurable mental capital always and everywhere. We are in the business of buying high and selling higher, or of selling low and buying lower. Strength usually begets strength; weakness, usually, begets more weakness. The obvious corollary is that in bear markets one must try only to be short or neutral. There are few exceptions. Lord Keynes said this decades ago and he was… and still is… right, for illogic does often reign, despite what the academics would have us believe about efficient markets! Metaphorically, the wettest paper sack breaks most easily and the strongest winds carry ships the farthest and the fastest. Be bullish when the technicals and the fundamentals run in tandem. Be bearish when they do not. In the “Good Times” even one’s errors are profitable; in the inevitable “Bad Times” even the most well researched trade shall go awry. This is the nature of trading; accept it. Move on. Complication breeds confusion; simplicity breeds profitability. Simply put, “When they’re cryin’ you should be buyin’ and when they’re yellin’ you should be sellin’!” But it’s difficult…very! The lesson of bad news is that more almost always follows… usually immediately and with an ever-worsening impact. The older we get the more small losses we take… and willingly so. This works well in life as well as trading. If there is a “secret” to trading… and to life… this is it! Need we really say more? Errors only get worse. No matter how much “work” we do on a trade, someone knows more and is more prepared than are we… and has more capital! 17: WHEN THE FACTS CHANGE, WE CHANGE! Lord Keynes… again… once said that “When the facts change, I change; What do you do, Sir?” When the technicals or the fundamentals of a position change, change your position, or at least reduced your exposure, perhaps exiting entirely. But they are to be broken only rarely and true genius comes with knowing when, where and why! This is the final Weekly Insights for calendar 2018. I hope you all enjoyed reading my weekly snippets and analyses as much as I did researching and writing them. It's been a long and eventful year, and not just because of share market shenanigans at the very end of it. During my presentations and media appearances this year I have felt on numerous occasions a genuine connection with investors in that they sensed the overall context for the share market was changing, but nobody had as yet properly explained the how and why of it all. At FNArena, the team has continued developing new additions and further improvements to our service. Last week we launched ESG Focus, a new dedicated segment to our news service. We have one more fresh initiative upon our sleeves before year-end holidays kick in. That'll be my final-final effort for the year, before I retreat to spend some time near the water, hiding from the sun, catching up on a million things left to do, including reading some more, and recharging the inner battery. I sincerely hope 2018 hasn't been too much of a disappointment, and that our efforts at FNArena, including my personal observations and insights, have made a significant and positive contribution. Next year will be different again, as is always the case. May Dame Fortuna smile graciously upon you all. Weekly Insights will resume at the end of January. Till then take care, and all the best. We shall continue this relationship in 2019, hopefully. My weekly appearance on Your Money (the channel formerly known as Sky News Business) is now on Mondays, midday-2pm. I shall make an appearance on Peter Switzer's program on Your Money on coming Monday, 7.30pm. (This story was written on Tuesday 27th November 2018. It was published on the Tuesday in the form of an email to paying subscribers at FNArena, and again on Thursday as a story on the website. Part Two will be published on the website on Friday morning).